Pulau Tikus. The name always sounded exotic to the ears of a boy growing up in the general area of Ayer Itam (yes, not Air Itam), Reservoir Gardens and Rifle Range. At a time when I still measured distance by bicycle speed, the place was far enough away to be remote and close enough to be comfortably reachable. 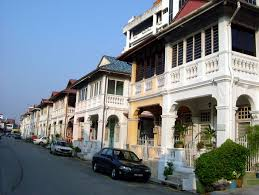 [In fact, now as I write these few familiar names of parts of Penang, they all sound exotic. It helps to have lived away long enough, I suppose]. Anyway, Pulau Tikus in my mind’s eye was centred round the traffic lights in the middle of the village, where Burmah Road met Cantonment Road. In that sense, it was a place I passed aiming for some other place. Unless of course I was going for an ice cream at the Tip Top or Top Top outlet close by. Or getting a cheap haircut and a neck twist a few metres from that junction. Or heading for the wet market at the earlier turn-off on Cantonment for some wonderful char koay teow. In fact, there were quite a few reasons for me to stop at the place now when I think about it. The Thai and Buddhist temples on Burmah Lane were always an added attraction, for example. Cycling down from Ayer Itam, if you were heading for the northern beaches – these were not as comfortably reachable – you wouldn’t actually pass Pulau Tikus. You would cycle down Western Road towards the Waterfall, and then turn off onto quiet – yes, quiet – Gottlieb Road. Shorter that way. If you were passing Pulau Tikus village on a bicycle coming from Ayer Itam, you were probably heading for Gurney Drive. Gurney Drive. This mile-long promenade had a stretch of beach that was shadowed by casuarinas. If I was there late in the day, then there was always that special corner to dismount for a rest and a meal, which had been occupied seemingly for ever by a wonderful char koay teow stall working symbiotically with a jiuhu engchai seller. There, friends and I could sit down to eat, and shoot and feel the breeze at the same time. I wish we had taken more time to enjoy the view more. But then we took all these blessings for granted. Gurney Drive was also a quiet place. In the mornings, walkers would arrive in cars, bikes and what-have-you to move their healthy limbs, on completion of which exercise they would applaud themselves with a less healthy helping of bah-kut-teh with innards, liver and what-not, just to moderate the beneficial side effects of their morning exertion. In the evenings, the falling heat would attract another mix of people to stroll the stretch between pavement and shore. Always, with the thought of a good meal at some stall in the proximity awaiting at the end of the activity enhancing their enjoyment substantially. Now, late into the night, all manners of Penangites could be expected to appear along this magical mile of road. Sometime after the night clubs had closed, groups of young overdressed men, the lucky and proud ones among them accompanied by thin dainty women wobbling on new high heels, would burst and crawl out of badly parked cars, some to draw in breaths of fresh air to still their alcohol-filled stomachs, all to extend their party night just a bit more. There would be loners too. Some probably lived in the area, and those who did not, had come on their motorbikes. These they would slot between other bikes in as haphazard a manner as they instinctively thought possible, and they sit or stretch out on the often half-broken benches. Some brave couple may be visible, sitting on the sands in the dark away from curious eyes. They were generally politely left alone. There would appear transvestites too; some perhaps also ejected from the nightclubs. Unlike the groups of boys and girls whose party apparel had done their work for the night, these tended to still have their dress in good order. Speaking of the beach at Gurney Drive, I must add one last memory. I recall that there was a time back then, when I could scrap and dig for siput clams there on the beach. That was how clean the sea and sands were back then.